This is the story of lightkeepers’ contributions to the natural history of lighthouses in conjunction with the history and maintenance of the manned navigation beacons – their primary function of course – ‘for the safety of all’. Since keepers were first engaged to maintain lighthouses around our coast they have encountered wildlife, and in some cases developed a keen interest and expertise on the subject. Towards the end of the nineteenth century keepers were encouraged to submit annual returns of bird movements enabling reports on bird migration and several authoritative books to be compiled. As a result, ornithologists began to recognise how many lighthouses were well-placed to establish bird observatories – a few were in redundant lighthouses, often on offshore islands. However, lightkeepers also recognised that in certain weather conditions and during migration times, flocks of birds were attracted to the beam, resulting in many fatalities. While the problem is now better understood and considerably reduced, the automation of all British lighthouses has resulted in there no longer being lighthouse keepers to monitor the situation and report bird, sea mammal, insect and bat movements. 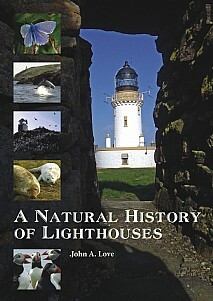 A Natural History of Lighthouses highlights the contribution made by lighthouse keepers over the last century or two to the study of natural history, and ornithology in particular. Much of this is discussed in the words of the keepers themselves, set in the context of lighthouse history. Scotland has an especially rich lighthouse tradition, mainly due to a dynasty of Stevenson engineers covering over a century, all of whom also had a profound understanding of weather and geology – and indeed natural history – so important in the placing of their lighthouses. Several redundant lighthouse buildings still function as bird observatories as well as wildlife viewpoints and study centres, museums, hotels, restaurants and private homes. The lanterns themselves are still maintained in this digital and satellite age, monitored remotely from a strategic control centre. This beautiful and liberally illustrated book will be of huge appeal to ornithologists, pharologists, everyone with an interest in the natural world, maritime history and who enjoys an informative read.